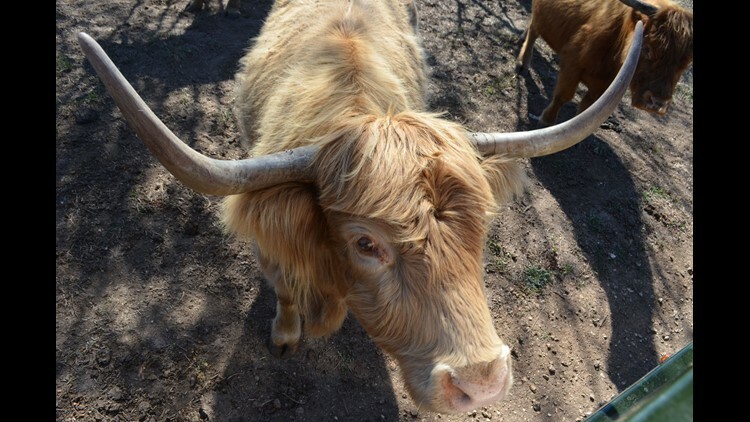 A Scottish Highland cow approaches the truck hoping to be fed. This is the largest herd in the Midwest. People get ready to go on the Gravity Bomb in Branson, one of only two such rides in the country. 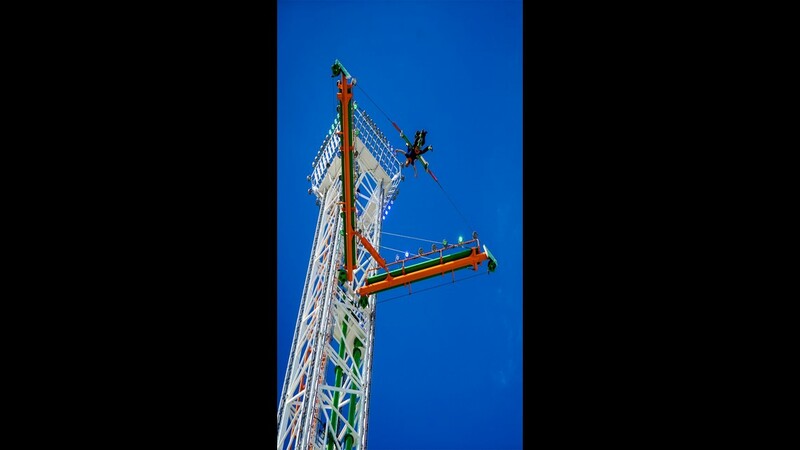 The Super Sling shoots people nearly 200 feet in the air and uses a magnetic braking system. 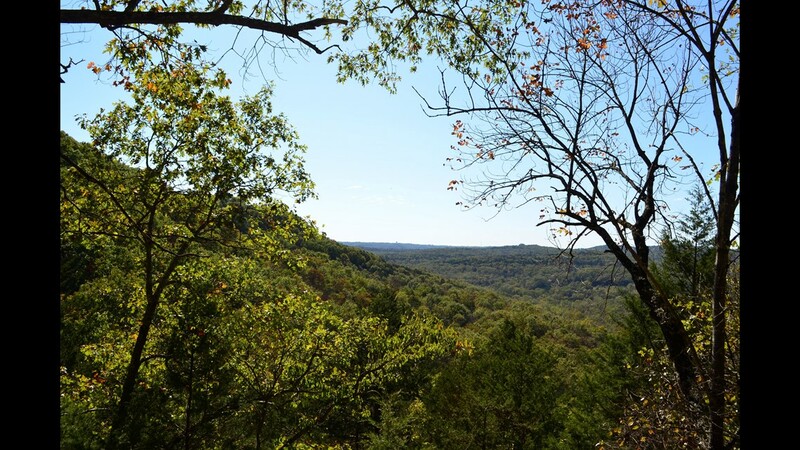 There are plenty of beautiful Ozark Mountain scenes on the Bigfoot expedition tour. 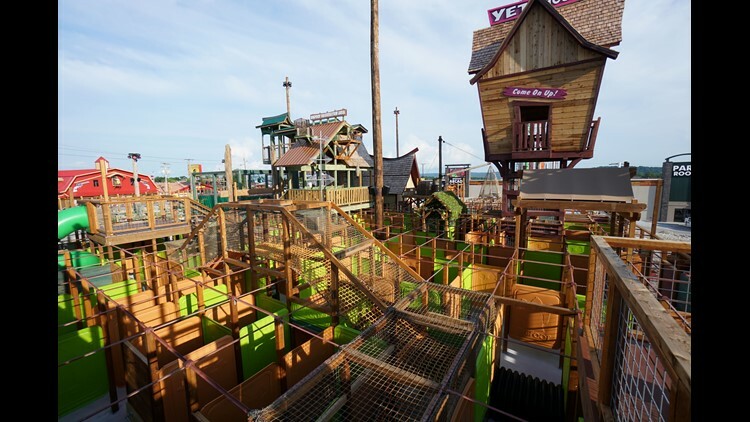 The Yeti Fun Zone and Maze at Bigfoot on the Strip has a variety of underground tunnels, a slide, rope climbs and more. 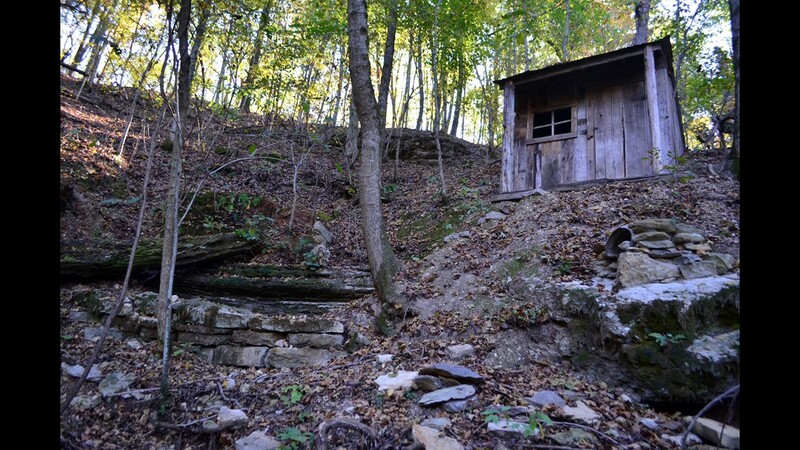 It is believed this spring was the water source for a man who made moonshine on the property decades ago and claimed to see Bigfoot. 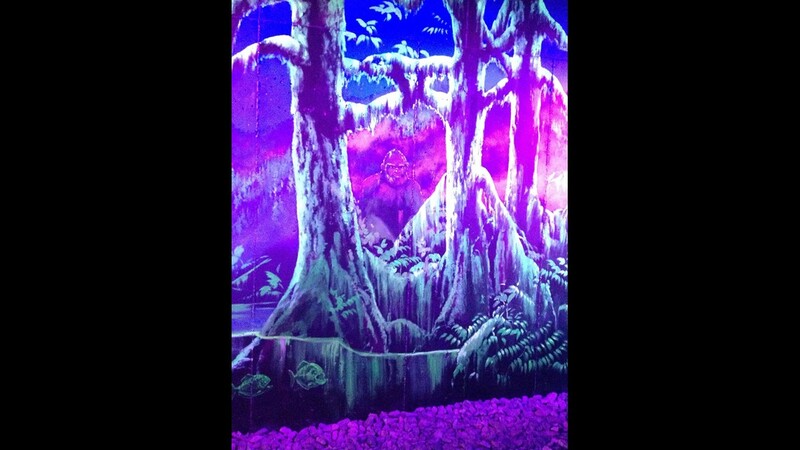 Springfield artist Emily Million painted this Bigfoot which is in a tunnel on the miniature golf course at the Branson attraction. 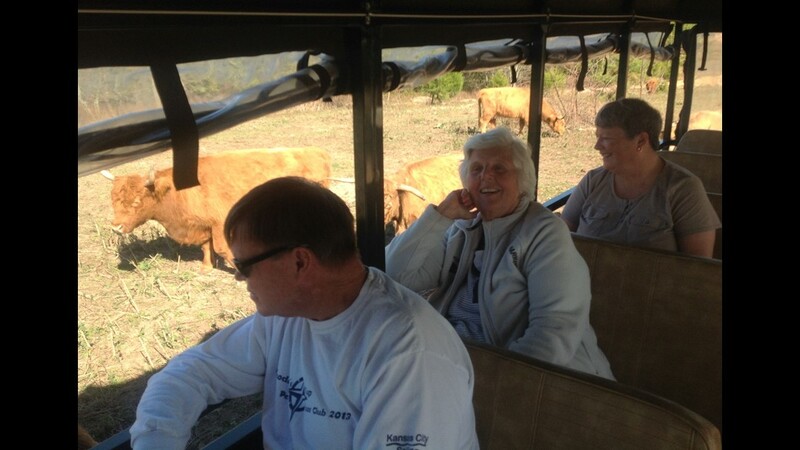 Front to back: Lee and Shirley Cline of Overland Park., Kan., and Nancy Smiley of Roseville, Minn., look out the window at Scottish Highland cattle. A Bigfoot-themed Branson attraction has filed a lawsuit over a TripAdvisor review left by a Kansas cattle farmer. 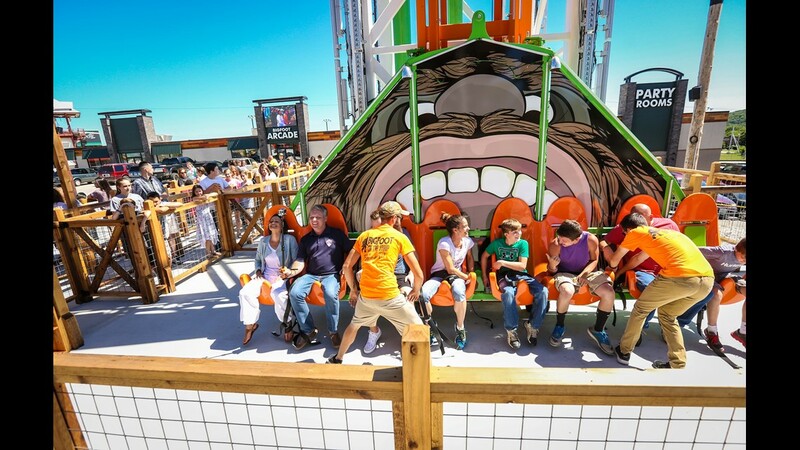 Bigfoot on the Strip, which opened in May 2017, is a "fun park" that features thrill rides, a mini-golf course, arcade, interactive virtual theater and a tour of Bigfoot Farms, which boasts the largest herd of Scottish Highland cattle in the Midwest. On March 3, Randy Winchester and his daughter, Emily, visited Branson for an annual meeting of the Heartland Highland Cattle Association. They said they took a tour of Bigfoot Farms with other meeting attendees. After returning to his home in Johnson County, Kansas, Randy Winchester logged onto TripAdvisor, an online travel site where he has left dozens of restaurant, hotel and attraction reviews. He left a review of Bigfoot on the Strip — which the Branson attraction later claimed in its lawsuit was born of "evil motive" and has exposed the business to "contempt and ridicule." Initially, Randy Winchester gave Bigfoot on the Strip three out of five stars on TripAdvisor. "All in all a decent experience but had we paid more than the $10 I would have been disappointed," Winchester said in his review. He wrote about spending five to 10 minutes feeding the cattle at the beginning of the tour and seeing "maybe 10 of the cows." Then, according to Winchester, the calls came. He updated his review to describe what happened. He said a man identifying himself as an owner of Bigfoot on the Strip had repeatedly contacted his daughter via cellphone and email and called his home phone on a Saturday evening to complain about his review. The man had also threatened to sue both him and his daughter, Winchester wrote. "I have significant reservations regarding any business run by someone who seems to think it is an acceptable business practice to contact family members and associates of a reviewer because they seem to be unhappy with a review," he said. Winchester changed his three-star review to one star. Bigfoot on the Strip filed a lawsuit in Taney County on April 13 against both Winchesters as well as their family business, Dancing Cow Farms, located in Douglas County, Kansas. The suit has since been moved to federal court. Bigfoot on the Strip called Winchester's statements "false and defamatory." The business is suing for libel, negligence and tortious interference. The lawsuit alleges that Randy and Emily Winchester did not take the tour and did not pay $10 to take the tour. Tour tickets cost nearly $40 for an adult and almost $30 for a child or about $100 for a family pass, according to court documents. Customers who take the tour do not spend five to 10 minutes feeding cattle range cubes and they also "do not see 10 of the cows," Bigfoot on the Strip says in the lawsuit. The business also denies calling Emily Winchester on her cellphone repeatedly or calling Randy Winchester's home phone on a Saturday evening. Bigfoot on the Strip is asking the court to order the Winchesters to remove all statements published about the attraction from its listing on TripAdvisor. Arkansas: Crater of Diamonds State Park. Indiana: Holiday World & Splashin' Safari. Maine: Coastal Maine Botanical Gardens. Michigan: Pictured Rocks National Lakeshore. Mississippi: Vicksburg National Military Park. New Jersey: Six Flags Great Adventure. New Mexico: Sandia Peak Tramway. North Dakota: Theodore Roosevelt National Park. Ohio: Cedar Point Amusement Park. West Virginia: Trans-Allegheny Lunatic Asylum. Wisconsin: House on the Rock. Randy Winchester's review was published to discourage people from visiting the attraction and to hurt business, Bigfoot on the Strip alleges. Bigfoot on the Strip is asking for the Winchesters to pay at least $25,000 and attorney's fees and costs. Bigfoot on the Strip is owned by Darrell Henley, Emma Hamilton and Matt Cook, according to court documents. Hamilton directed a News-Leader request for comment to an attorney. A message left with the lawyer was not returned. Court documents show a lawyer representing the Winchesters argues that the lawsuit should be dismissed because the court in which the lawsuit has been filed does not have jurisdiction over the defendants, who live and do business in Kansas. MORE: When do Springfield pools open this summer? Reached by the News-Leader, Emily and Randy Winchester declined to comment on the ongoing litigation. A crowdfunding campaign with a fundraising goal of $25,000 on FundedJustice.com featured Randy Winchester's name and describes the legal battle between Bigfoot on the Strip and the Winchesters. "This suit is based upon unfounded accusations and meant merely to punish me for stating an opinion and some facts on the online website TripAdvisor," the post said. The campaign on FundedJustice.com was deleted after a News-Leader reporter contacted Emily Winchester with questions about the post. As of Wednesday, no money had been donated to the campaign. According to TripAdvisor's website, Randy Winchester has been a member since 2010 and has left a total of 63 reviews. The only other one-star review left by Winchester was for Joe's Crab Shack in Olathe, Kansas, which is now closed: "Overprices (sic), terrible food. Fish is dry, crab legs and lobster overcooked, corn on cob is tough. Overall flavor of most food there is just poor. I go here because my 4 and 6 year old grand daughters like to go on their birthdays." Expert: "A very peculiar lawsuit"
The Winchesters are not the first to be sued by a business after leaving an unflattering online review. Similar cases can be found all over the country. A New York woman is being sued for $1 million by a gynecologist after she left a negative review online, CBS News reported Wednesday. A Florida couple were sued by their daughter's day care after leaving a review that started, "Warning: Child endangerment and abusive environment," WTSP of St. Petersburg, Florida reported recently. A one-star review on Yelp led a Texas husband and wife to be sued by a pet sitting business in 2016, according to CBS news. Paul Levy, an attorney with Public Citizen in Washington D.C., has litigated online free speech cases since 1999. He does not represent either side in the Branson lawsuit. Levy, after reviewing court documents, said Bigfoot on the Strip's case is "unusual" in his experience. "This is a pretty mild review," Levy said of Randy Winchester's post on TripAdvisor. "They gave it three stars out of five (initially). They said it was okay, not worth more than they paid for it, which is an opinion." Levy said he does not consider the details in Winchester's review — such as the amount of time spent feeding cattle range cubes and the number of cows that he saw — as defamatory. "Defamation is a false statement of fact that has the tendency to hurt someone's reputation," Levy said. Levy pointed to the other reviews of Bigfoot on the Strip on TripAdvisor. There are more than 165 reviews, more than 95% of which are "excellent" or "very good." "To me, it strains credibility to think a single negative review is going to make that much of a difference," Levy said. In fact, Levy said, suing a customer over a review can draw much more negative attention to the business than the review itself. Levy said that if there are "really serious false statements" in a review, it's up to the business to decide whether it's worth a lawsuit. However, the suit by Bigfoot on the Strip left him with many questions. "It strikes me as a very peculiar lawsuit," Levy said. "It's hard to imagine why this would be a sensible business strategy for a small business, unless there is something beyond what meets the eye going on here."